Case in point. Two cases, really. Gumballs! from a couple of days ago, and today's Warbonnet. The first is all about the subject, the realistic representation. Light, shade, colors all faithfully rendered. The second translated, rendered, realistically, yet not “photographically”. Someone once said: To translate a book, read it. Then read it again. And again. Then write it. In other words, not a literal, word for word, translation. That's what a computer can do, often with comic or even tragic results. There is definitely an amount of skill needed to render a super realistic depiction of an object or objects, and I love doing it. I hope I manage to bring a little of myself to the piece, though. I certainly try. But what of the second example. There's no mistaking what it represents. Most of its component parts are recognizable. But it's slightly more expressionistic, the language of the paint different, more important. Or maybe I could put it this way: One is like words carefully printed, the other, words done in calligraphy. Both valid. Both justifiable. So what's the big deal? I've done both styles in the past, as well as variations of both. For me, it's a big deal because through the recent series of abstractions I'm learning to exercise this handwriting deliberately, comfortably and with an authority that I have not previously had in oils. I find the Gumballs! exciting the way they are painted. But I had avoided painting the Warbonnet ever since I photographed it at the Autry Museum in Los Angeles, because I felt it would be boring if rendered in that way. When I came across it again, but with the abstracts fresh in my mind, I couldn't wait to paint it in this language that I'm finally getting comfortable with. OK, maybe it's not such a big deal, but it is a step in the right direction! The language you speak of in your blog about Warbonnet is like music for your eyes. You look at everything with an artistic eye and the way you describe things is like a free art lesson:-)! 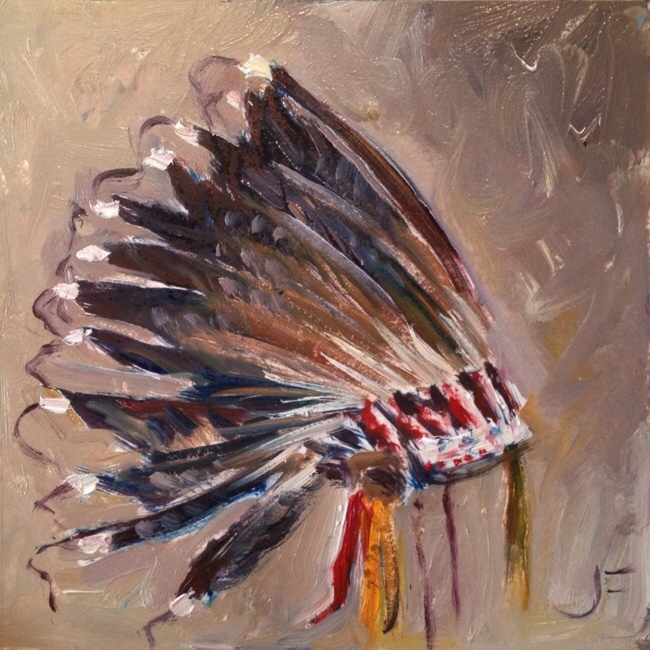 Beautiful warbonnet and so hard to believe that it is only a 6″ x 6″ painting. Love the WARBONNET. The colors stand out so fresh looking. To me it is a big deal and a big step in the right direction.